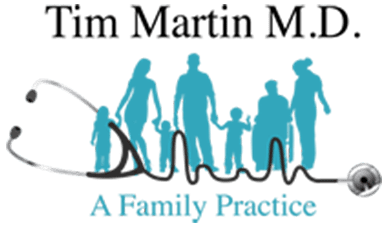 Send A Message To Tim Martin M.D. If you have any questions, concerns, or comments regarding Tim Martin M.D., please fill out the short contact form below. "I love the staff and Dr Martin is an awesome doctor. I feel very welcome coming to his office. Big thank you to the best doctor in town!" "Dr. Martin was able to pick right up where my previous doctor left off. He didn't treat me like an addict or someone who just wanted medications." "I'm a new patient and I loved the office and his staff. Took the time to get to know me and hear my concerns. Everyone was polite and professional." "My wife and I have recently started seeing Dr. Martin about starting a good Wellness program. He takes the time to explain things so we can understand." "Rather than a long review I'll just state that I believe I am very fortunate to have Dr. Martin"
"Best family doctor ever! He sees everyone in our family. We never have to wait long for an appointment. He has a great "bedside manner" and is very reassuring." "Dr. Martin and his staff are wonderful. I love that we as a family can see him for all our needs." " have nothing but the best things to say about the whole staff! Jay is the best! He always is very kind, tells me everything I need to know."